The Concise Oxford Thesaurus is aimed at helping you find exactly the right word, whether you're writing a letter, preparing a report, composing an essay, or solving a crossword. Over 300,000 alternative words cover everyday vocabulary as well as more unusual and specialist words, alongside a clear indicator of informal, dialect, literary, and technical items. Other useful features include thousands of example phrases helping you to select the correct word, with opposites and related terms clearly marked. Also includes advanced search and language tools that have become the staple of quality mobile language apps from MobiSystems with content from Oxford University Press. effortlessly find words using a clear, functional, and easytouse interface. The integrated search tools activate automatically the moment you start typing Search autocomplete helps find words quickly by displaying predictions as you type Keyword lookup allows you to search within compound words and phrases An automatic ‘Fuzzy filter’ to correct word spelling, as well as ‘Wild card’ ('' or '?') to replace a letter or entire parts of a word Camera search looks up words in the camera viewfinder and displays results engaging features that help you further enhance your vocabulary ‘Favorites’ feature to create custom folders with lists of words from the extensive library ‘Recent’ list to help you easily review lookedup words ‘Word of the day’ section to help expand your vocabulary every day If you have any questions, feedback or suggestions please contact us directly at support@mobisystems.com. Check these links to find your download for Oxford Concise Thesaurus for & iOS or for your device iPhoneiPod TouchiPad. 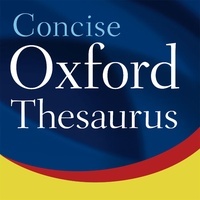 The app Oxford Concise Thesaurus is compatible with te following devices.